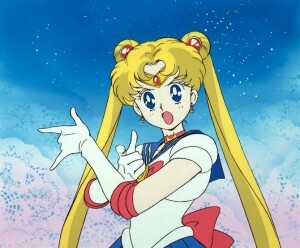 Soon in Japan the Sailor Moon anime will be airing in an HD remastered version. It will be airing starting on April 6th 2015 at 6:30pm Japan Standard Time on NHK BS Premium, a satellite channel by NHK, the Japanese Broadcasting Corporation. Nothing official about the remastering process has been revealed at this time. A high quality image of Sailor Moon from the original anime is included on the Sailor Moon official site along with news of this broadcast. This image is of great quality, though at 670×447 resolution this does not appear to be an actual screenshot from an HD version of the show given it’s low resolution and improper aspect ratio. An HD screenshot would need to have 1080 or 720 lines of vertical resolution and the aspect ratio would need to be 4:3 or 16:9 if it were cropped for a widescreen display, not the 1.2:1 that this image has. If it is a screenshot, it’s been scaled and cropped to look best on the web to the point where not much can be told about the state of the remastering. Perhaps this will simply be an upconverted version of the standard definition video. Hopefully they will be going back to the film source to get better quality footage. Although this method is more difficult and sometimes impossible depending on what source material is available, it will result in the best quality HD version. With the Japanese DVD release of the series the first season of the anime was remastered in progressive scan though this was not done for later seasons. With a new HD version of the anime being made, a Blu-Ray release in Japan may be coming as well, though no such announcement has been made at this time.